New York, NY – As we quickly approach Thanksgiving, the rush for a well-rounded holiday menu has already begun. You want to showcase your exemplary culinary skills to your friends, family, and coworkers, right? Don’t worry - you are way more fun than just mashed potatoes. Bellucci has just the recipe to kick-start your Thanksgiving celebrations. Preheat oven to 425 °F. In a large bowl, mix together the butternut squash, 4 tablespoons Organic Bellucci EVOO, maple syrup, salt and pepper. Spread the seasoned squash onto a large rimmed baking sheet. Roast until squash is golden and tender, about 30 minutes. Half way through roasting time, toss with metal spatula. When squash is tender, remove from oven and transfer to a platter to cool. In a small sauté pan over medium heat, add 2 tablespoons of Organic Bellucci EVOO. Add the sage and cook about 2 minutes, edges will begin to curl. Remove from pan and drain on paper towels. Brush both sides of each slice of baguette with Organic Bellucci EVOO and set on a baking sheet. Toast the bread slices in the oven for 8-10 minutes until golden brown. Set aside to cool. In a medium bowl, mix the goat cheese, lemon zest and ½ teaspoon of salt and ¼ teaspoon pepper. Adjust seasoning as needed. 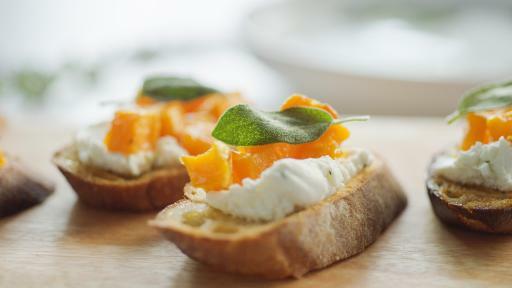 Assemble the crostini – spread the goat cheese mixture on each slice of toasted baguette. 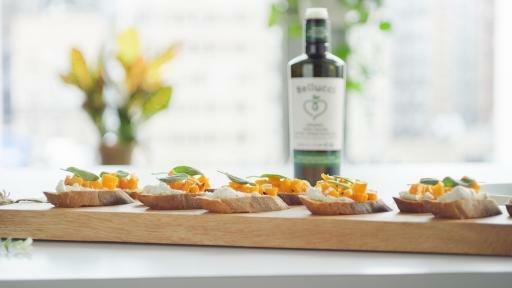 Top with a few cubes of roasted butternut squash and drizzle with Organic Bellucci EVOO. 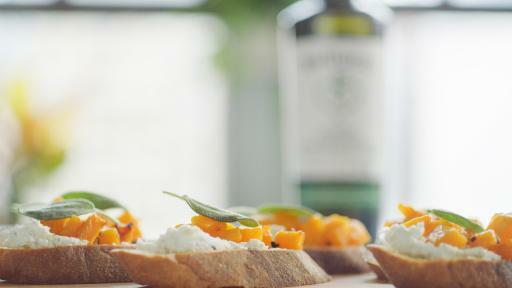 Place on serving platter and top each crostini with 1 or 2 sage leaves. The earthy and robust chèvre, coupled with the fresh flavor of our fully traceable Organic Bellucci EVOO is the ultimate combination. We learned that our consumers appreciate the truthfulness in our sourcing model, and knowing that our EVOO is fully traceable from the rural groves of Italy. 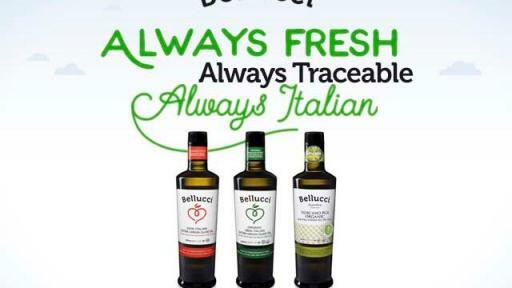 In an ever-changing digital world, we guarantee consumer confidence with our exclusive Bellucci traceability app to trace each bottle to source from any smart phone or tablet. Try it – you won’t be disappointed. Looking for Bellucci? You can find us at your local supermarket using the Bellucci store locator: http://belluccipremium.com/en/store-locator or at the Bellucci online store: http://store.belluccipremium.com.